A couple thousand boisterous people, many wearing wide-brimmed hats and long sleeved shirts crowd into a small, darkened plaza. As the music begins a fuse is lit, then another and another. Within a couple minutes forty devils with their horns spewing a constant rain of sparks have danced into the mass of people. The devils all have several nine inch firecrackers tied to their horns and tail, each one with a slow-burning fuse of a different length. If you find yourself in the crowd you quickly realize these demons can come at you from any direction, and their horns and tails can explode at any time with a great flash of light and a bang that can be heard a mile away. La Bulla (BOO lya) they called it hundreds of years ago. The boiling cauldron, one might say. It's a cauldron being stirred, a dance where everyone is prodded thru a festive, first-hand experience of the inferno. 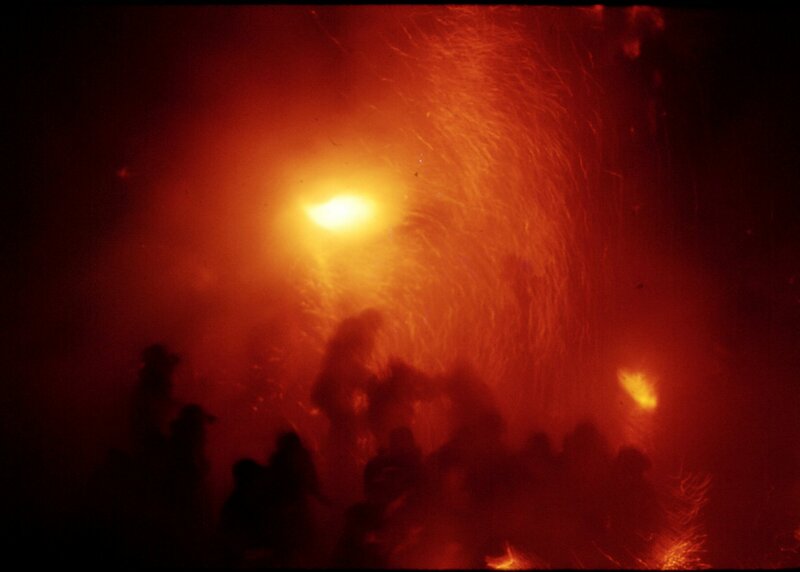 This part of the festival is now called the Plens - the devils are plens de foc (full of fire). For most people this is probably the high point of the festival. It definitely gets your blood pumping. On the coals they dwell."